I have worked on this over the last week or so as i had a bit of spare time due to injury. This is fabulous and i highly reccomend you have a go if like me you have an Excalibur dehydrator. Somewhat essential to this. Chicharrones are a mexican delicasy or humble pork skin snack. There are many ways of making these. But this way creates light fluffy but delightfully crunchy snacks. 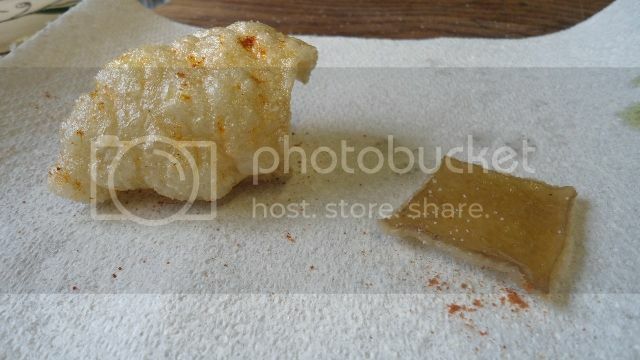 This picture taken this morning shows from the right the dehydrated piece of pork skin. on the left in its fluffy gloriousness and twenty secs later a chicharrones. lightly sprinkled with sea salt and smoked paprika. A piece of pork skin from the loin or above the spare rib or collar. 1. You have two choices here. Either remove the back fat from your piece of skin and use else where. Making sure to remove all of the fat. 2. Or simply place the skin with fat into a pot of cold water with a couple of fresh bay leaves and a few peppercorns, coriander seeds and a sliced onion and carrot. These are not essential but will flavor the stock if you wish to use after. 4. remove from liquid. it will feel a little firmer but still soft. Carefully remove all of the skin from the fat. and i mean all trace. 5. gently pat dry with kitchen towel and place on mats of dehydrator. Turn to 68 degrees centigrade 155f and dry for approx eight hours or overnight. The neatness of yours rather puts mine to shame though! Thanks guys, I have a dehydrator for making jerky so I'll be giving these a go soon. Do I still need to cook the skins prior to dehydrating if I've cut the fat off for sausage? If you want them 'puffed up', you need to boil the skins till soft, and then dry them completely. SteveW wrote: Thanks guys, I have a dehydrator for making jerky so I'll be giving these a go soon. Do I still need to cook the skins prior to dehydrating if I've cut the fat off for sausage? As wheels said, it is also imperitive you remove all fat from the skin. I have found through trials that it is a good idea to remove the fat before boiling but again when cooked. this way it is possible to cut that extra thin skin. this will aid drying and later the puffing. Finally, because all of the fat has been removed and the skin dried prior to frying. this snack is not as calorific. Do try and vary the spices and salt mixture for sprinkling on the chicharrones. I generally mix two parts salt to one black pepper, one smoked paprika. Or replace the paprika with a good madras curry powder. being mexican of course, cumin & coriander & chilli powder would also work very well. My overall conclusion from making these has been some what mixed. The whole operation, even with a dehydrator, is time consuming and energy consuming. Although great fun. I would find it difficult to do again and again. I undertool the exercise simply as a way of utilising the vast amounts of pig skin i often have left over. And as it takes me a year to bring on a single pig it is a raw product i do not wish to waste. If any of you have one or more ideas of how i might utilise pig skin fro my woodland reared Tamworth pigs then please let me know. I believe it changes the mouthfeel of a sausage in a nice way. You might try a small experiment to see what you think. There are some good reasons to include it in sausage, but what goes against it , to my mind, is that the same people who will happily pay £1 for a minute bag of 'scratchings' in a pub, turn their nose up at the same thing used in a different way in a sausage. There's 'nowt so fickle' as the UK public! How about the 'non-puffed' type of pork scratchin's? They'd be easier to make. I use it rolled in casseroles, and in particular in cassoulet; I'm guessing that you don't sell those though? There's got to be others, but none spring to mind at present. If you have to much rind, just make more Cotechino, simple. One of the greatest foods on earth. BTW, that's another sausage (like all my Chorizo) that I was taught to always leave in the tub overnight before stuffing. Ahhh cotechino another italia peasant sausage that i have made many many times. Sadly however, english people are so what fickle toeard this one. I perswonally think it is great and a useful way of utilising pork skin. But like so many rind emulsions is best served only in the depth of winter. I love the idea of making scratchings but again it is a time element. So much time and so little profit. Unless of course you are a huge manufacture. Where do you do Saturday markets? St Nic's? It's the same the world over. I was talking with Jason Story at Three LIttle Pigs Charcuterie in DC, and he said exactly the same thing - one of his favorite snacks, one of his most popular little items, but one of his most labor intensive products to make. They really are amazing, though, fresh out of the fryer. Without going fully commercial with expensive equipment, I'd probably look at something like a surface trimmer like those from Bettcher. They make short work of trimming and surfacing meat cuts, and would probably make the job of trimming pork skin much faster. Too pricey for home use, but a small operation could save a lot of time, and other uses as well. Google Bettcher whizard for info. Skins are very popular item here best ones are made in the north, and are cut in long strips so they sorta look like curly fries when fried up. Making them in strips saves some labor in cutting the skins. Never made them for sale, we render the fat off the skin, then crank up the heat and crisp up the skins till rock hard and use them for dog treats/chews.